Join us for complimentary drinks from 6 to 7 p.m. every night. Rosedene a Cape Town guest house in City Bowl was originally part of a 19th century rose farm on the slopes of Table Mountain. The main house has been through many mutations over the years and became a guest house 25 years ago. It was bought by Nick, a yacht captain, during a stop in Cape Town while he was on a world cruise. His vision was to create a guest house with an informal home-away-from-home feel, with friendly and informative staff to help visitors make the most of their stay in Cape Town. 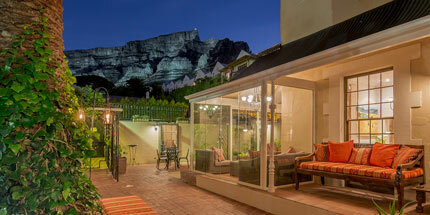 Many conversions and renovations later, Rosedene Guest House was “born”. Our accommodation is comprised of 11 beautifully appointed Deluxe rooms and 4 two-bedroomed cottages – perfect for families. Set in tranquil and picturesque gardens with Table Mountain as a backdrop, we are an unexpected oasis in the middle of the hustle and bustle of the city. The V&A Waterfront is a short ten minute drive, whilst trendy Kloof Street with all its epicurean delights is just a stone’s throw away. The world renowned beaches of Camps Bay and Clifton are quickly and easily accessible and Table Mountain is merely a hop, skip and a jump! We are also well situated to access the main arteries that will take you to Stellenbosch, the winelands and the Cape of Good Hope. Enjoy Cape Town with your kids!